From entering your event schedule, inviting participants, to units registering participants for activities. It's all covered when you use GreenBar HQ. Save time, save money and impress your participants by bringing your event activity registration online! Web based software gives your camp all the benefits of a top notch system without any of the costly infrastructure or staffing requirements needed to maintain it. Simply subscribe and use. The program was designed and developed by an Eagle scout with scout camps in mind. While it certainly can be configured to work for non-scout related camps, Boy Scout councils will find everything they need to administer their camps built in. Change is difficult. 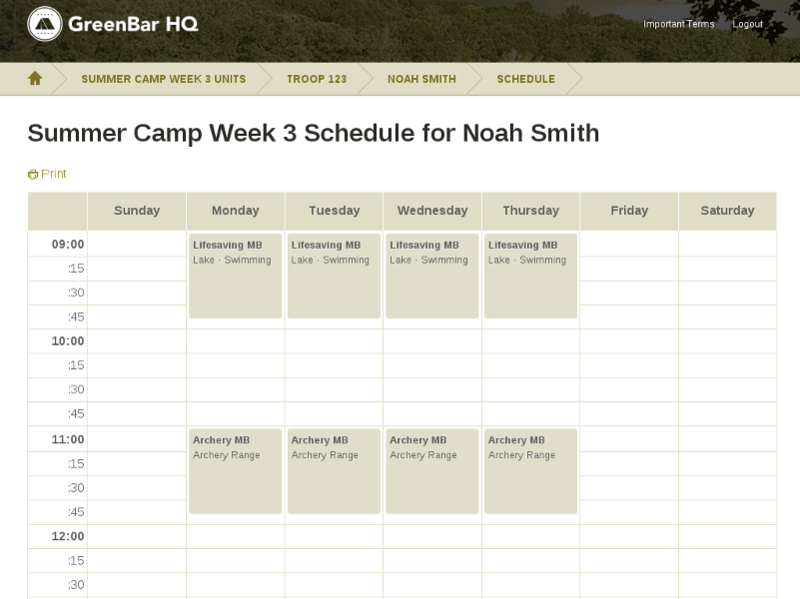 GreenBar HQ makes implementation and user education a breeze with an easy to use interface and support resources. Your first 10 participants are free to try it out! The name and logos for GreenBar HQ are trademarks of Goerlich Solutions Group LLC. All text and design is copyright © 2004–2019 Goerlich Solutions Group LLC. All rights reserved.